Given the raging hugging epidemic that is threatening to overtake our schools (see Alabama, Illinois, and Virginia), the School Board has decided to take preemptive action to stem this tide of unsanctioned emotion. In response to this disturbing trend, the school board has passed a Zero Tolerance Policy on Physical Contact. This policy includes, hugs, high fives, handshakes, and all other inappropriate forms of Public Display of Affection (PDAs). In order to maintain the integrity of this new policy, the following books (see list below) are now banned from all school libraries, classrooms, and personal collections. The School Board has decided (through a unanimous vote) that these titles are no longer appropriate because they promote subversive behavior which may undermine the authority of school administrators. This ban is effective immediately. A School Board representative will be conducting periodic site visits to ensure that these books are no longer present on school grounds. Schools that continue to carry these titles will be reprimanded immediately through a series of escalating sanctions and funding penalties. The following books are banned and are to be extricated from all school grounds immediately. This list, however, is a small sample and should not be considered complete. 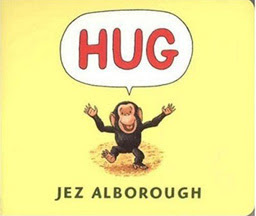 As a precaution, all books with the word "hug" in the title, or any books featuring any illustrations of hugging or hug-like behavior should be permanently removed or placed under lock and key in a state-approved vault until further notice. Official Reason for Ban: Monkey See, Monkey Do. Official Reason for Ban: No time is Hug Time when you're at school. Official Reason for Ban: The contagious nature of hugs is precisely the reason for the Zero Tolerance Policy. 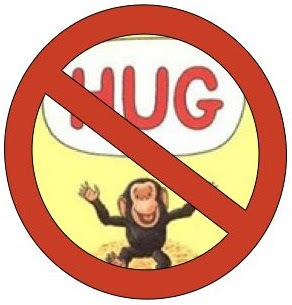 Note: The school board is approaching Ms. Melmed and Ms. Lewin to propose that they revise A Hug Goes Around as a cautionary tale for children that will be used in schools to discourage this inappropriate behavior. Please distribute this list to all faculty, parents, students, and other concerned citizens. We appreciate your cooperation in this matter and cannot stress enough how vital this is to the educational and social-emotional future of our children. Together, we can rid ourselves of this shocking behavior and minimize the disturbing displays of human emotion that are currently infecting our schools. Ohhh, this doesn't read too far from the truth! Most importantly, would "The Gas We Pass" (http://www.amazon.com/Gas-We-Pass-Story-Science/dp/1929132158/ref=pd_sim_b_img_7) be banned? Making contact with someone's gas is pretty offensive. And if it is banned, I need to do some major reworking of this year's curriculum! Alkelda, I know... they are strange days that we are living in. Farting while giving (or receiving) a hug is never acceptable. and I'll happily design a lesson plan around that one fundamental truth if you want me to sis.